Think Cancún is just about frozen margaritas and resort buffets? Think again. Raphael Kadushin finds that the city is trading its spring-break image for serious culinary bona fides. Bladimir García, head chef at Ramona restaurant, is a true mole master. His spicy mole del centro, commonly found in Mexico City, blends peanuts, pistachios, almonds, and ancho chile. He douses his short-rib stew with mole del olla, a vegetable-heavy version from central Mexico. And the smoky mole de Oaxaca on his turkey breast contains chilhuacle chile, native to the southern part of the country. What’s most surprising about all these artful moles is where García is serving them: Ramona is located in Nizuc Resort & Spa, on the edge of Cancún, a city more commonly associated with mudslide-like moles, limp tacos, and endless tequila shots than with thoughtfully sourced, ambitiously prepared cuisine. How did a culinary scene blossom in this former gastronomic wasteland? Simple: now that Mexican chefs are turning into global stars, like Enrique Olvera (Mexico City’s Pujol), Alejandro Ruiz (Casa Oaxaca), and Daniel Ovadía (Mexico City’s Paxia restaurants), many ambitious cooks who had left for European kitchens are returning or choosing not to leave in the first place. And Cancún, flush with resort cash and dense with uninspired hotel restaurants, is an obvious destination for them—especially since the city’s increasingly food-savvy visitors are no longer willing to settle for soupy guacamole and assembly-line enchiladas. The result is a flurry of great new restaurants on and off the resort strip. 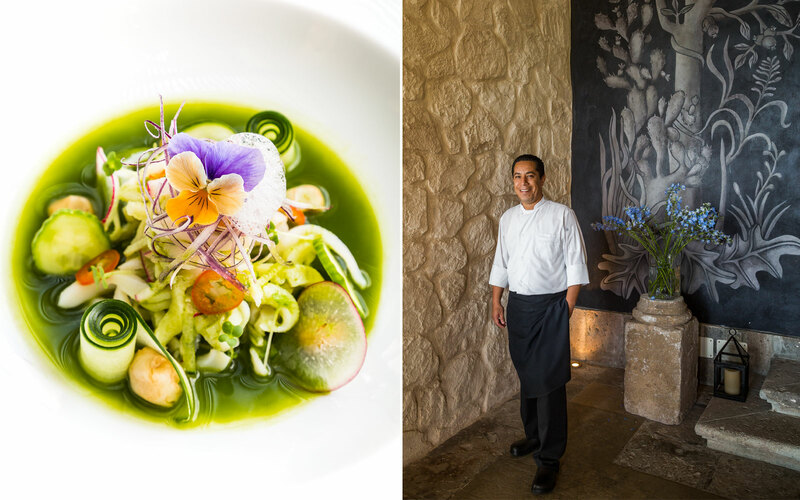 García’s kitchen at Nizuc—an airy sweep of Yucatecan wood, sandstone, and Mayan-inspired murals situated between mangrove forests and a coral reef—is the leader in Cancún’s new food movement. 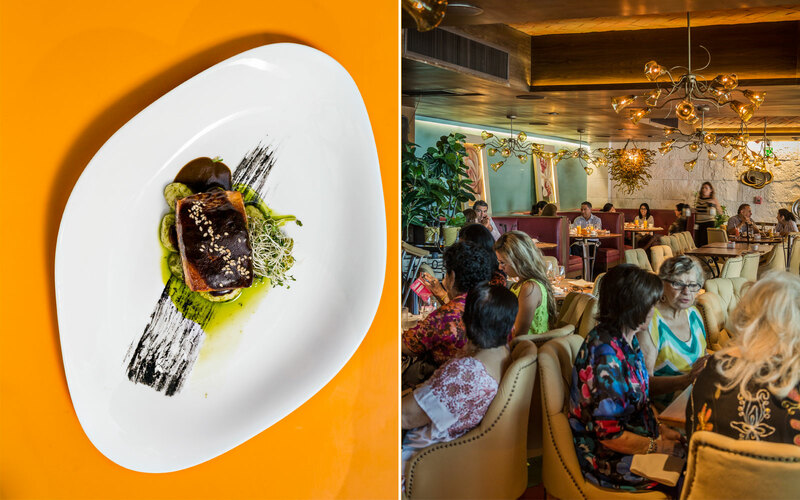 The chef’s ambition, he says, is to present diners with “traditional recipes elevated by new techniques.” Ramona’s elegant, pared-down dining room looks out on the Caribbean Sea, the source of the seafood that fills García’s menu. This includes hogfish smoked Mayan-style in corn leaves; octopus marinated in chipotle sauce; lobster with a plantain purée; and a sea bass that rests in a green mole emulsion with herbs from Nizuc’s garden. There’s also turf to go with all that surf, like a slow-cooked suckling pig from a nearby farm, paired with Yucatecan onion compote and roasted pineapple. Entrées $19–$41. At this restaurant in the Fiesta Americana Grand Coral Beach Resort, chef Francisco Flores Obieta draws on earlier stints cooking in France and at Pujol. His grouper fillet marinated in annatto and a cactus-leaf salad tossed with roasted Oaxacan grasshoppers are characteristic of his menu’s indigenous bent. Entrées $15–$23. Inside Azul Sensatori Hotel, Jonatán Gómez Luna Torres shows off his training at Spain’s legendary, now-shuttered El Bulli with extensive tasting menus that favor foams, crystals, and shape-shifting dishes (foie gras masquerading as cotton candy). But the culinary theatrics don’t obscure the down-home flavors of the cochinita brioche or the taco de hoja santa. Tasting menu $150. 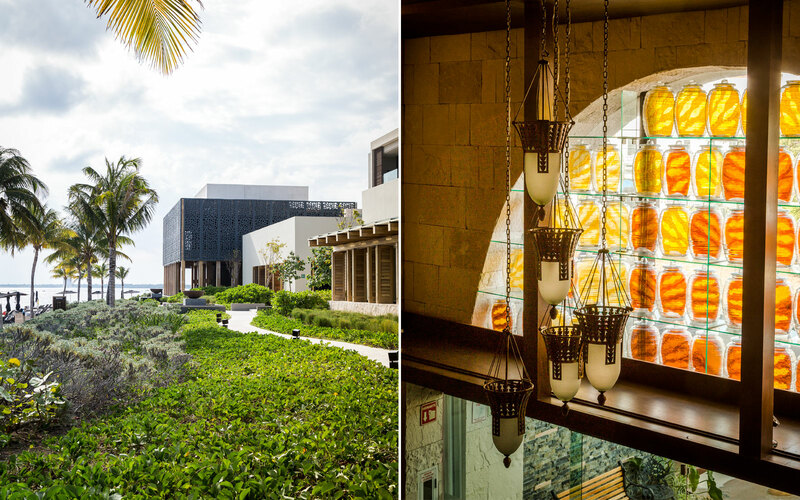 Opened in 2012, the restaurant at Paradisus Cancún is fronted by Martín Berasategui, the Basque chef known for his namesake Michelin three-starred restaurant outside San Sebastián, Spain. His presence might suggest that Cancún is headed the way of Las Vegas, with celebrity chefs who make only rare cameos in kitchens bearing their names. But this is no culinary hit-and-run. Berasategui is deeply involved in Tempo, visiting regularly to review the menu, while giving his in-house chef, Ismael Medina Hernandez, freedom to adapt his recipes to suit local ingredients. That results in dishes like a risotto tossed with fennel pearls sourced from Veracruz, a creamy potato soup studded with braised fresh-caught octopus and shrimp, a grilled white tuna drizzled with a tropical mango purée, and tea ice cream crowned with crispy cacao nibs. Entrées $12–$75. This intimate, 40-seat dining room sits inside its chef-owner’s own white stucco house on a residential block in central Cancún, far from the big beach resorts. 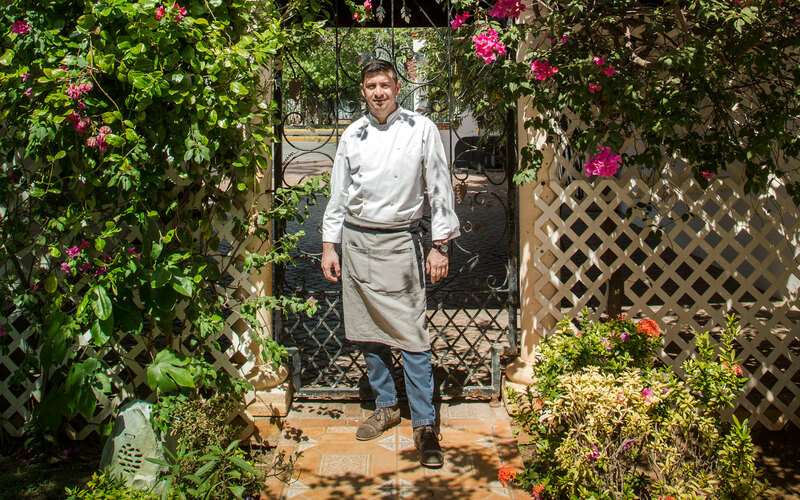 The 36-year-old Morales, who has worked at restaurants throughout Europe, adds Mediterranean accents to classic Yucatecan recipes in his campaign to prove that Mexican food can be, as he says, “more than just tacos and beans.” The cross-cultural payoff comes in the form of silky langoustine carpaccio, an osso buco with chiles and beans, and best of all, Morales’s signature dish of ravioli stuffed with huitlacoche, the Yucatán’s characteristically earthy corn fungus. Entrées $12–$75. Around the corner from Morales, sisters Lupita and Irma Chavez offer their own salute to regional cuisine with variations on old standbys that pile up the flavors on a single plate. Take their flautas, filled to bursting with duck, walnuts, orange, and honey; their tuna encrusted with hibiscus flowers, served over smashed sweet potatoes; or their shrimp, marinated in salsa borracha and topped by mango guacamole, roasted pineapple, and red onion. The most distinctive dish, though, inspired by the cooking of their native state of Jalisco, is a bowl of goat meat swimming in a broth of cilantro, lime, and chorizo. The traditional Mexican folk band that performs nightly adds to the festive mood. Entrées $6–$23. This scruffy, street-food-centric establishment is as close as the city gets to boho, with rotating art exhibitions and graffiti decorating the walls. The main attraction, however, is 29-year-old native son Christian Rodriguez’s beer-braised beef tongue taco—a definitive rebuke to the city’s cautious cooking of old. Rodriguez’s backstreet café in such a humble setting might feel like an outlier, but its dedication to reviving the Mexican table takes Cancún’s culinary ambitions to the next level, and suggests that the current wave of inventive dining hasn’t crested yet in this suddenly interesting resort town. 46 Guadalupe Victoria; 52-998-115-1617; entrées $10–20.